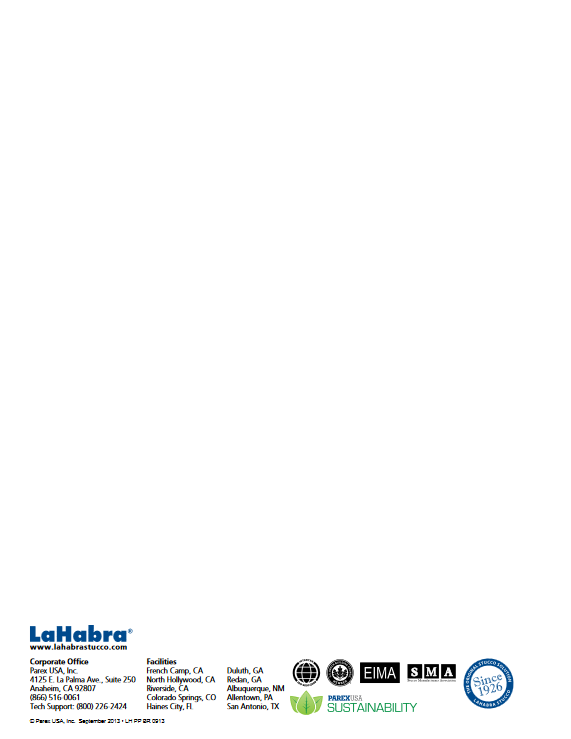 ​I had some trouble finding downloadable pdf color charts for LaHabra's ​products but I did find ​them eventually and wanted to make it easily available to those of you out there that may want to download one for yourselves. 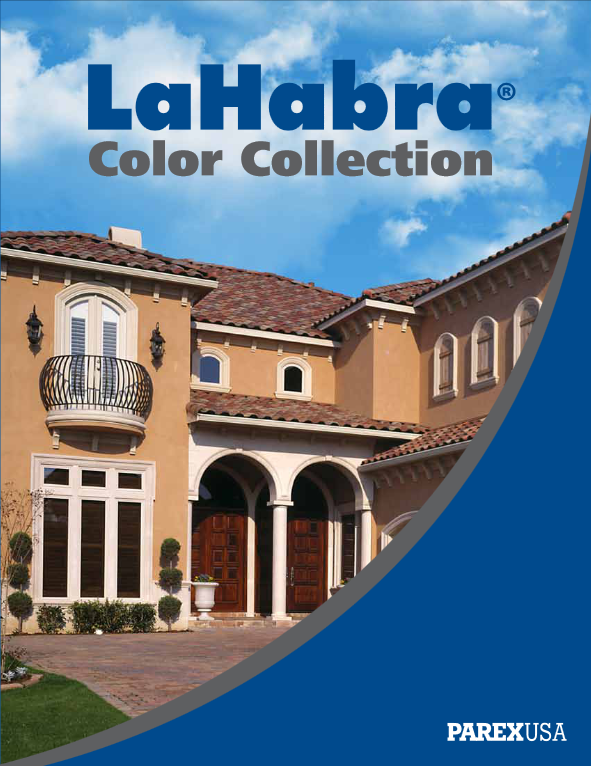 ​Remember that these are color representations and colors can vary due to different screen resolutions and color configurations and it is always best to get a color sample from LaHabra so you can get a more true representation of the actual color. 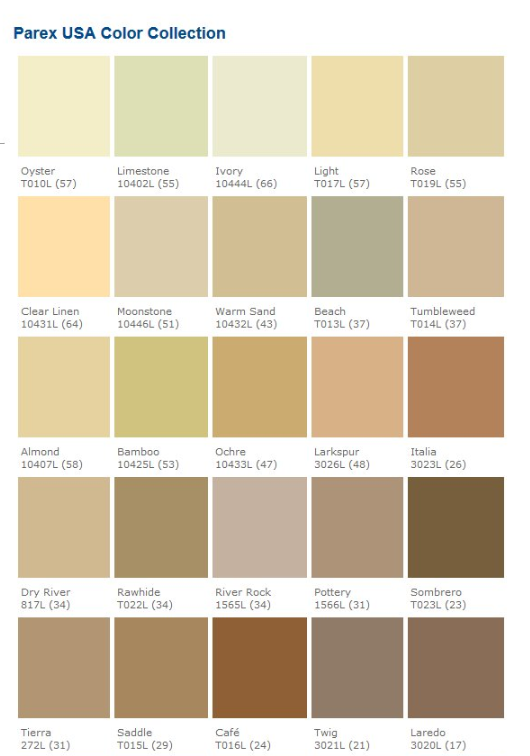 Different textures will also affect color, ambient moisture in the air, application method and other things that will affect the overall color and it is best to apply the color to a small area of a wall or sample board in the desired color and tecture to get a much more accurate representation of the color. 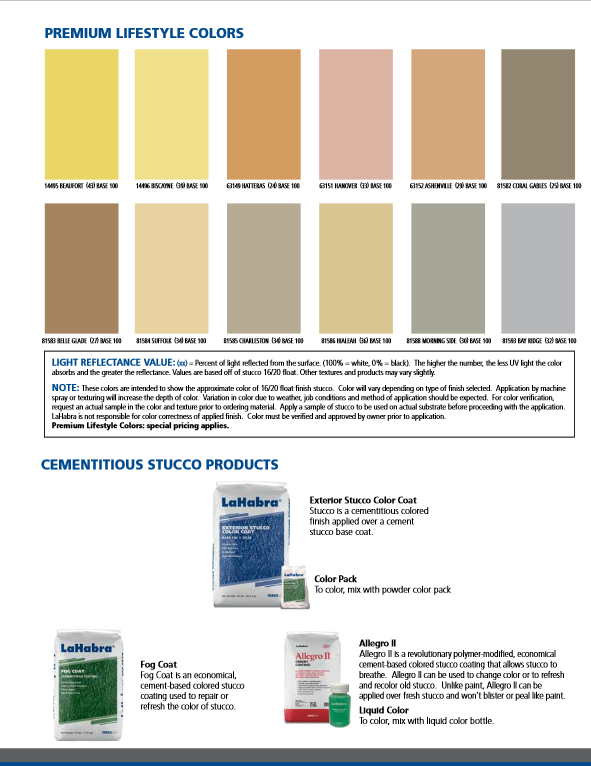 ​There were a lot of very neat info points in LaHabra's color chart that I though I should touch on that might be helpful for others who may not know a whole lot about stucco materials in general. 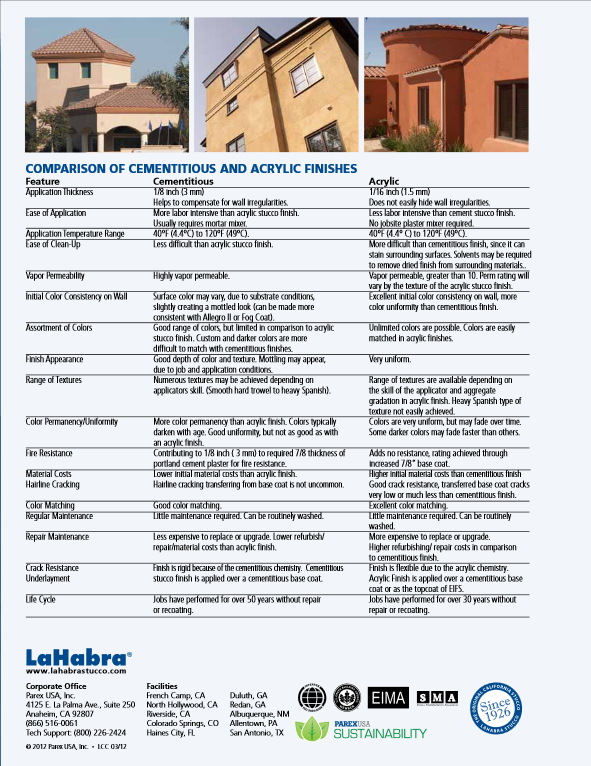 ​In LaHabra's color chart, I found a very cool comparison of their acrylic finishes and their cement based finishes like the one I made but goes into a little more about other aspects that you may want to consider. It was a very helpful resource that I think a lot of people could benefit from. 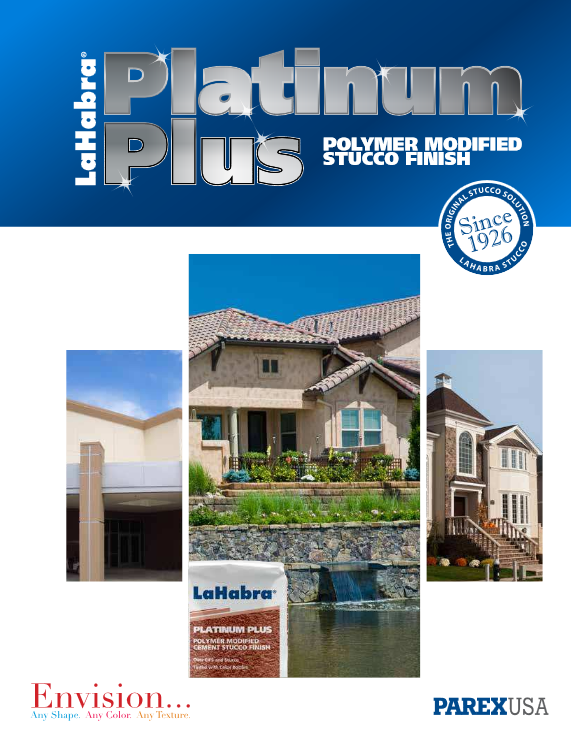 ​LaHabra does offer a couple of different acrylic finishes that ​can be used for the many different color charts. 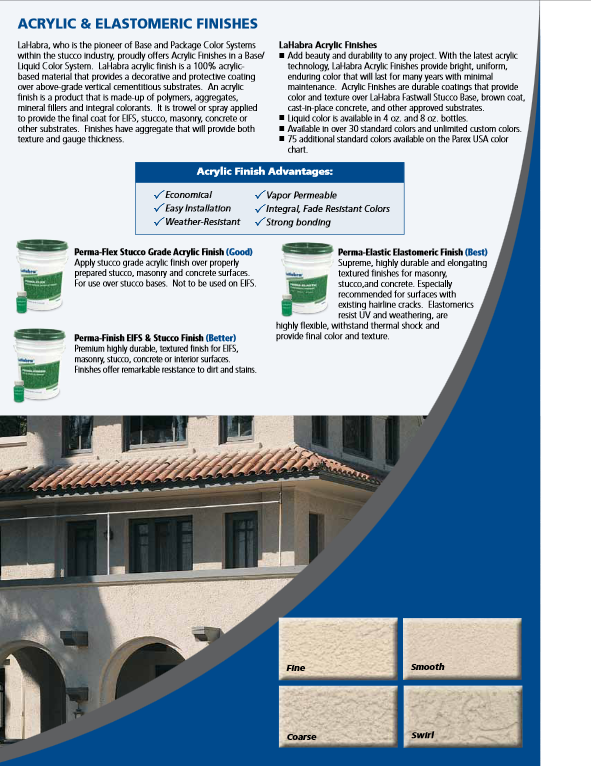 They have a very helpful image that explains the three different acrylic materials they offer and what they are better suited for, including some of their strengths. 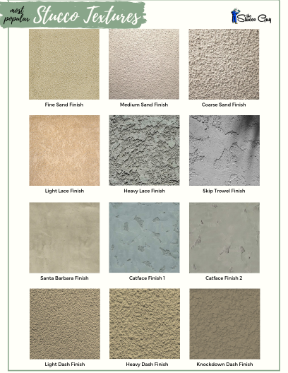 Be aware that there will be a price difference in material (more than likely) and you should compare costs before committing to a specific finish product, if that is something that will affect your overall choice. 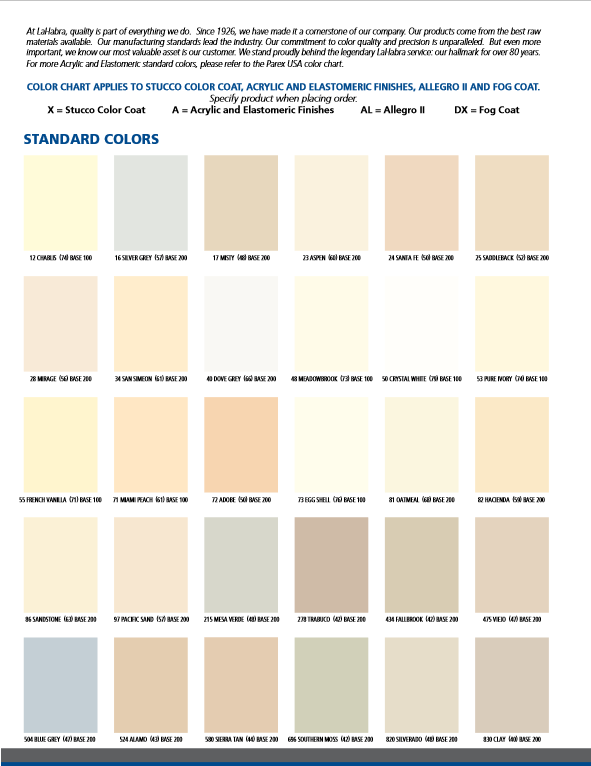 ​There is a small note within the standard and lifestyle color chart that states what materials you can use in conjunction with this color chart. 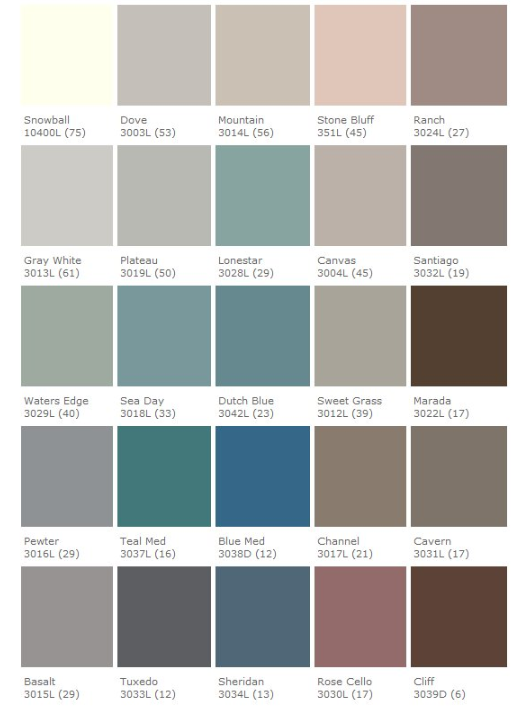 From the looks of it, you can use this color chart for their cement based finishes, acrylic finishes and even their fog coating products. 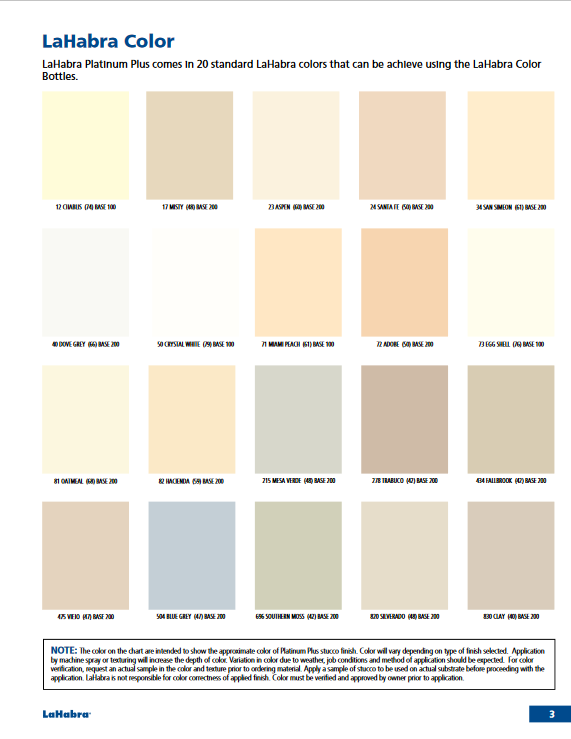 They also offer another additional color chart (Parex USA Color Chart) that has even more color choices to choose from if you are planning on using one of their acrylic finishes. 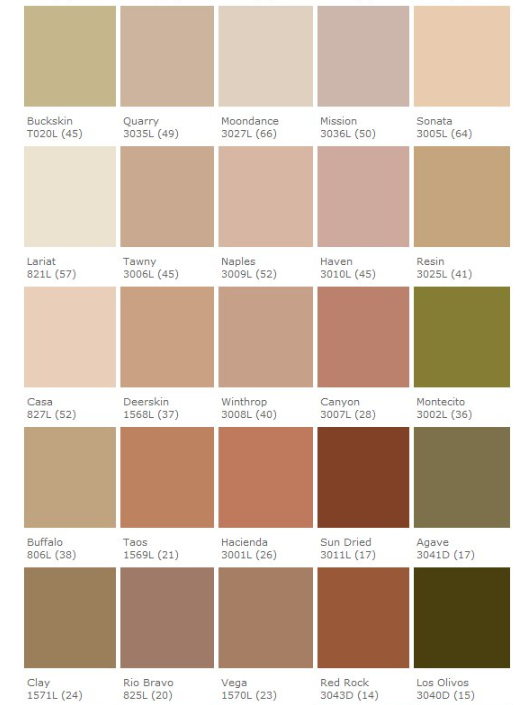 ​If you look at the different colors listed on their color chart, you will see numbers that are between 0 and 100 that are in parenthesis (33) that reflect the amount of light that the color will reflect or absorb. The higher the number, the more reflective ​the color will be and the lower the number, the more the color will absorb the sun's rays and likely heat up as a result. 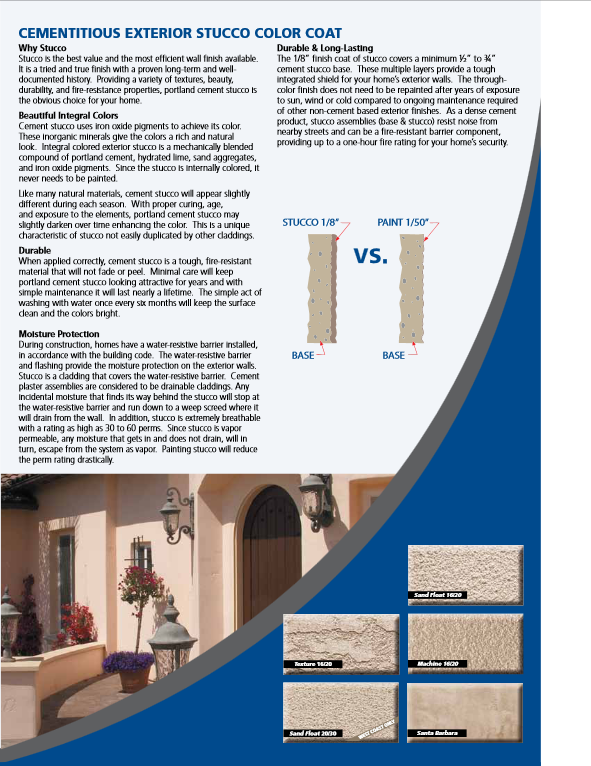 The other important note is the color disclaimer that they include that states pretty basic info that all stucco manufacturers must include. 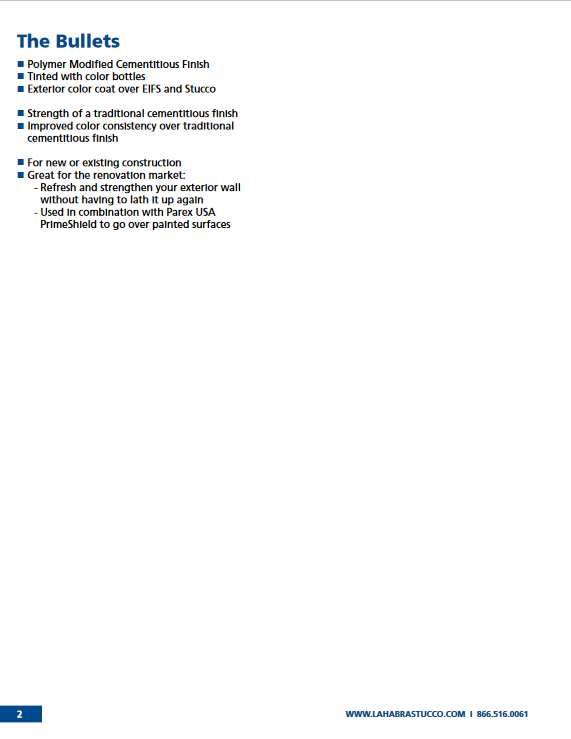 It is worth a read so you understand "color representations" better and know what to expect.